1. Browse the site and order as usual. 2. When you are ready to check out, click the "Cart" button under your clothing selections in the upper right hand corner. 3. Copy the voucher code in your e-mail from PHS and paste it in the "voucher" field on the order form. 4. Click "add" and your voucher will be applied to your order. It's just that easy! Remember: if your total amount purchased is more than the voucher you have been given will cover, you will need to pay for the amount over the voucher amount by credit card just as in a non-voucher order. CAUTION! 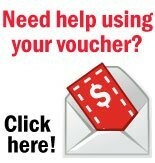 Vouchers are one-use only! If you don't use the entire balance in one order, the excess amount will not be available to you. Your voucher expires with the first use! NOTE: Vouchers may not be used for 'Accessories' or 'Headwear' in the Company Store section of the menu.